Make a roux by heating 1 ½ cups of oil in a black iron pot. Slowly add 1 ½ cups flour and stir it in. Stir constantly and cook until it is a little darker than peanut butter…a nice brown. Lower heat to medium and add onions. Sauté about 15 minutes. Add bell pepper and celery and sausage and cook for 10 more minutes. At this pint transfer roux to a gumbo pot or leave in the same roux pot if it is large enough. Add hot water and stir in. 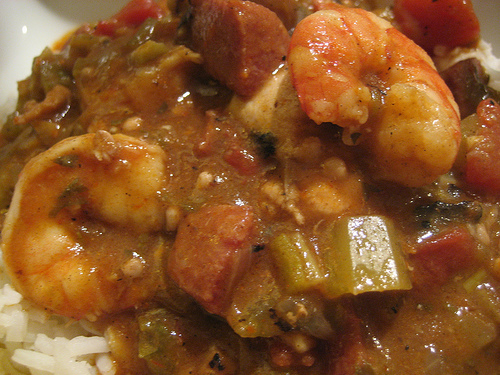 Adjust heat to allow gumbo to simmer. Add bay leaves and seasonings. Cook till simmering. Turn heat lower to make a gentle simmer and adds shrimp and okra and continue cooking about 30 minutes. Taste for seasonings and adjust. Add the crabmeat and green onions and parsley and basil and cook about 15 minutes longer. Reserve a half cup of parsley and green onions to sprinkle upon serving. Serve over hot, fluffy rice.